We have taken the time to create this resource which we hope will be of use to other home inspectors. We have been in business and licensed as inspectors for over 25+ years and we thought it would be useful to make a complete list of the best tools and deals that we have found and use daily in our business. 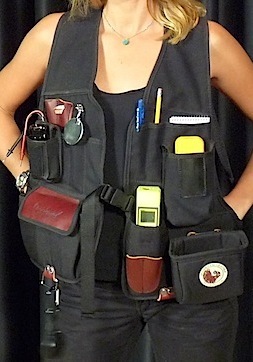 An inspector needs a few professional tools to carry out a thorough home inspection. It is very common for them to carry a lot of tools with them; some of which are rarely used. However, would you believe that one of the most important home inspector tools is a flashlight? The other important tools to use are definitely an electrical tester, speaking of which, you should never underestimate the importance of an electrical inspection for your home, a ladder and a moisture meter. These three simple tools can be used by a professional inspector to uncover many faults in and around most homes as guided by InterNACHI Standards. Lastly, regardless of whatever tools a home inspector chooses to bring with them, a tool bag to fit and organize all your equipment is very important. Please Note: A seasoned inspector can do more with just their nose, fingers, a ladder and instinct than a novice would; even with a full kit of the most expensive and sophisticated tools! A home inspector’s bag of tricks is quite expensive to fill all at once if you’re looking to have everything required in the business with you. As many professionals in this industry will advise you, experience is the best teacher in home inspection and you find that most of tools in your tool kit are bought out of necessity as you continue to encounter different problems in your day to day home inspection gigs. Honestly, as we have grown as a company we are moving towards buying these more and more. We now keep at least 5 of these in stock at our shop for our new employees. We make it a practice to give each one of them their own complete home inspection equipment kit. Most of our employees are already seasoned and have their own tools, but we just want to be sure that there never comes a times where they are stuck in the field without something they need. This already assembled kit includes everything that you need from soup to nuts and is a huge time saver. We’ve also found it to be much cheaper than buying everything one by one. If you do your own due diligence we are sure that you will find the same. Some inspectors might not want to go with the tool kit and instead they might choose to assemble their tools piece-by-piece. It’s all a matter of preference really, if you have certain tools that you know you want or if you just really want to make sure you have the best equipment possible then this might be your choice. 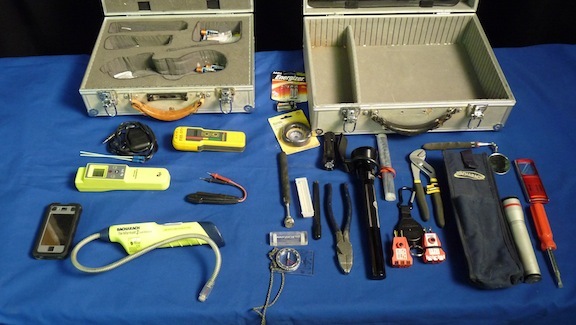 Flashlight – This is perhaps the most essential tool in an inspector’s belt. If you find yourself in a situation where you are crawling through dirty and dingy crawlspaces (which you will) you will be thankful for not being el cheapo and just going for the least expensive one that you can find. Electrical Tester – You really need this. Testing a home’s electrical power as well as the grounding is a crucial part of the home inspection. We recommend that you go the same route as an electrician would here and grab yourself a Klein or Fluke tester. You’ll thank us later. Respirators – If you come in contact with a house that has mold in the walls or maybe a moldy basement then you will be extremely thankful you have one or two of these in your arsenal. Moisture Meters – These will generally come in two different types, moisture and search meters. You will definitely need to make sure you own or have access to one of these bad boys. 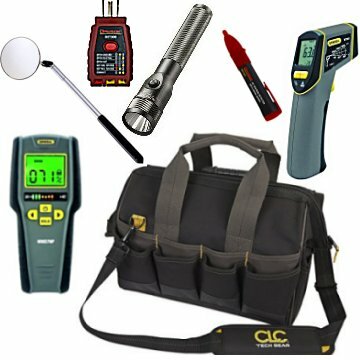 In addition to the basic home inspection tools that would be necessary for a thorough house examination (flashlight, a ladder, a moisture meter, and electrical testers), there are more tools that come in handy for everyday home inspection business and these include a respirator, an AC voltage detector, matches, screwdrivers, tool vest, water pressure gauge, safety glasses, gloves, small pocketknife, a thermometer, coveralls, a tape measure, GFCI Receptacle Tester, knee pads and an inspection mirror among others. For veterans, you will probably find two or more of each tool highlighted above in their home inspection tools collection. This is from years of dealing with different scenarios as they go about their professional business. Of course this is after discovering how each type of duplicated tool in their arsenal helps make things easier in different situations (according to make, model, accuracy and functionality). In conclusion, be cautious when shopping around for tools because many places simply will not have what you need or will be charging you a premium that is simply not necessary to pay. We will continually keep this resource updated with the lowest prices and best deals that we find. We will also keep our readers informed of any special sales that are going on as well. You should be armed with the right tools that not only make work easier throughout the entire process but are also pin point accurate to avoid any guess work. It will also be important to note that tools for home inspectors are only as good as the person using them and veteran home inspectors can cover a lot of ground in your home using only the most basic tools of trade and still come out with a comprehensive report. We hope that you find some value from this resource, it has taken us quite a bit of time to put together!